In 1909, a club by the name of Dundee Hibernian was formed to represent the city’s Irish community. 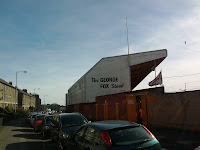 Much of the Irish population actually lived in the Lochee district of the city and it was expected that the team would set up home there. 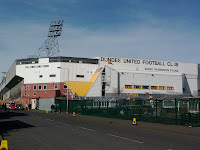 However, rather than building a new ground from scratch, the club’s owners took the rather controversial decision to set up in the Clepington Park area of the town – home of the then leading local club, Dundee. Changing their name to Dundee United in 1923, the clubs continue to play only 200 yards apart – the shortest distance between two senior football grounds in Britain. 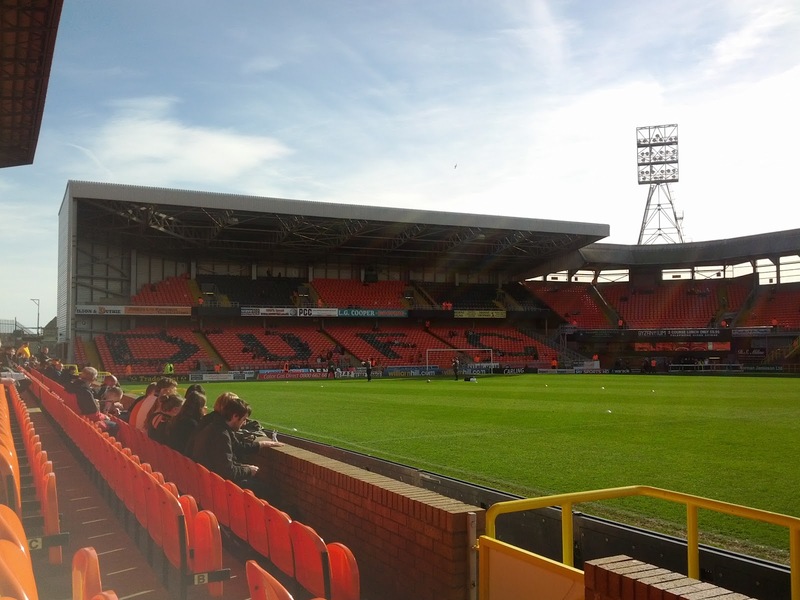 The only two clubs who are closer than Dens and Tannadice are that of MTK and BKV Elore in Budapest. 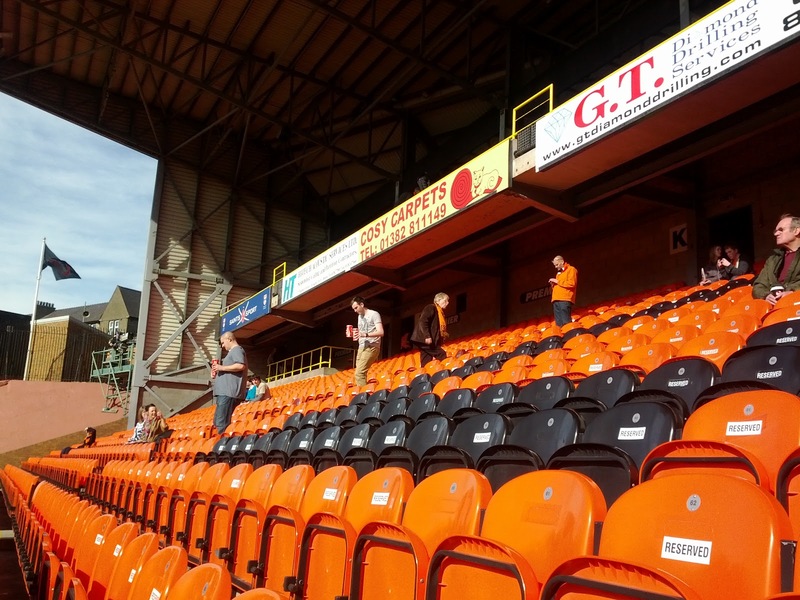 Approaching the ground and passing Dens Park, I noticed that the white sections of the stands at Tannadice could all do with a bit of a clean. Then I chastised myself for being a great big girl and realised that I’d actually passed five stands and not four. Five you say? The George Fox Stand (where I sat), an impressive two-tiered stand running along one of the sides of the pitch. Confused? Quite right! Utterly bizarre but fantastic in its craziness! Also delightful at Tannadice was the fact that inside the George Kerr stand they have a retro looking Souvenir shop which sells hats, scarfs, badges and old programmes among other things. A really nice little touch and something I’ve not seen before. All in all, I’m a big fan of Tannadice. It is a mental construction with absolutely nothing making sense or matching in any way. Good score. The food at Dundee United was very good quality wise, but quite expensive for what you get – standard SPL unfortunately. They do have a bit of a treat in the form of a Chicken Balti Pie which I didn’t risk and something called a “Family Bag” which is…erm…I’m not sure! For the sake of a story lets say it included a Daddy Pie, a Mummy Pie, a Baby Pie and a dog in a pie. Having never in my life sat in with Dundee United fans before, I didn’t really know what to expect. That said, anywhere I’ve been where United have been the travelling support has been pretty noisy and I wasn’t disappointed as a “home fan” during this game. The United fans were good humoured, good natured, extremely welcoming and really very knowledgeable about their team, the opposition and the game in general. Even as Celtic started to dominate in the second half, the fans were impressive and in particular, after the first Celtic goal. Each and every one of the fans around me stood to their feet and roared their side on despite being down to ten men and probably, already knowing that a heavy defeat was quite likely. Their song of “one shoe, you’ve only got one shoe….between the lot of you….you’ve only got one shoe. ONE SHOE…*repeat*” also cracked me up – I suspect this is some kind of dig at the fact the visitors were Glaswegian. Johnny Russell: The boy was subject of a bid from Celtic in January and I can see why. This is the first time i've seen him in the flesh and he really impressed me. His movement is excellent. He has a fantastic leap on him for quite a little guy and when combined with his pace and strength, I think United have got a great wee player here. If he keeps his head, he'll turn into a good player for a decent sized club and for Scotland as well. Gary Mackay-Steven: He was MOTM when I watched Airdrie last season and he was superb again for the 30 mins he was on the park at Tannadice. He's a nature flair player. Loves to beat a man. Love a cross and a neat through ball. An excellent signing from Peter Houston and evidence of the fact that there is talent in the lower divisions who can step up and play in the SPL. More managers need to take a stab, in my view! Gavin Gunning: Good player. Strong, commanding and powerful centre-half. Everything that Garry Kenneth is not. Again a very good signing from Houston who has put together a very tidy United side indeed. They may have taken a 4-0 beating on the day but there is absolutely no chance that there were four goals in this game. United were superb for the first half, they really were. I felt they were by far the better team, pressing Celtic, troubling them with each attack and over-running them in midfield. Had it not been for the lunacy of Robbie Neilson, the Terrors may have found themselves in the Semi Finals, if not facing a replay at Parkhead next week. 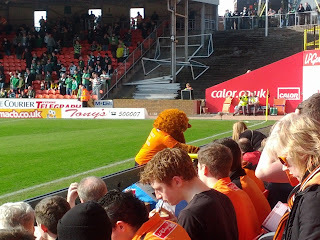 Instead, they were eventually over-run by a very clinical Celtic team. 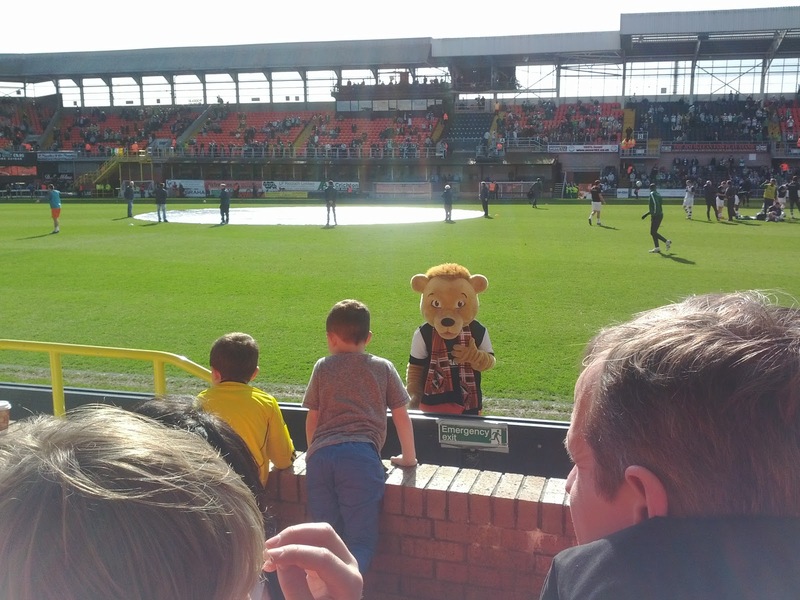 This hasn't massively detracted for the value for money judgement at Tannadice. It cost me £22 to get in and, if United play as they did in the first 45 with 11 men, most weeks they will not only entertain but will beat most of whom they face as well. 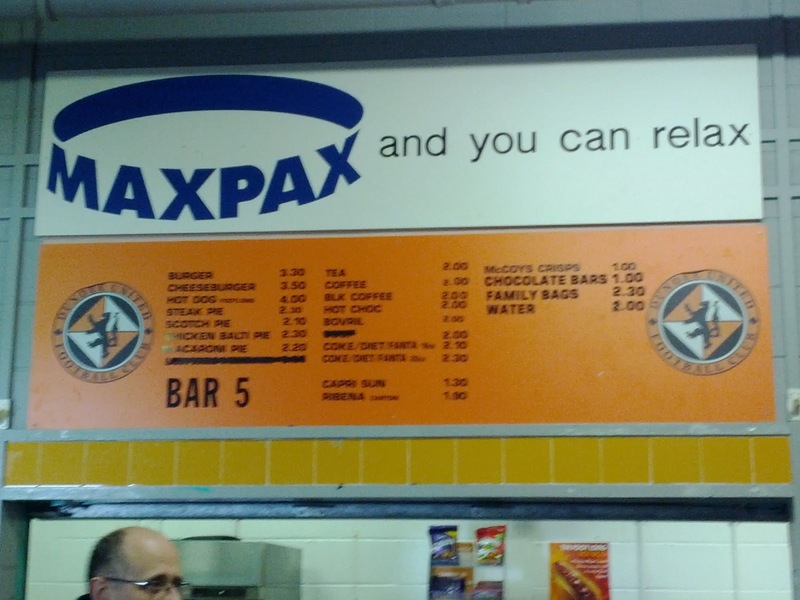 The food was excellent (if a little pricey), the stadium was nice and weird and the fans were first class. 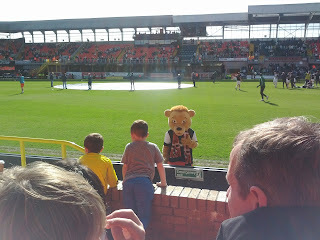 Try Tannadice as a neutral, ladies and gents, it was a great wee day out! 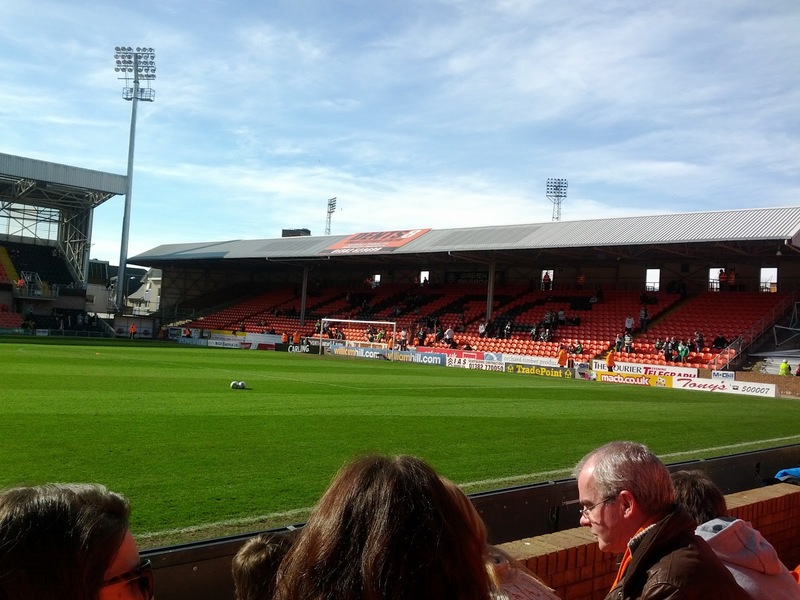 I suspect had they had 11 men for 90 mins and continued their first half performance, I could well have been packing the #OTWRB bags and heading to Tannadice with a season ticket next season! 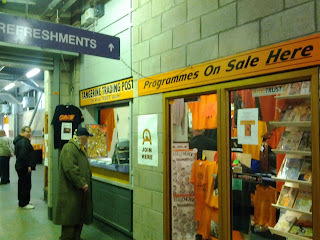 Very enjoyable read, I was in the shed (West stand) and you could hear the Arabs get behind their side. Pity they could not fill the remaining few hundred seats. 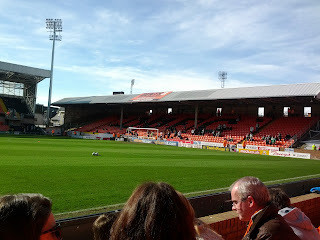 I normally sit in the Jerry Kerr stand and it is very quirky, almost maze like wandering around the bowels- but a great view of the action apart from the near touchline. 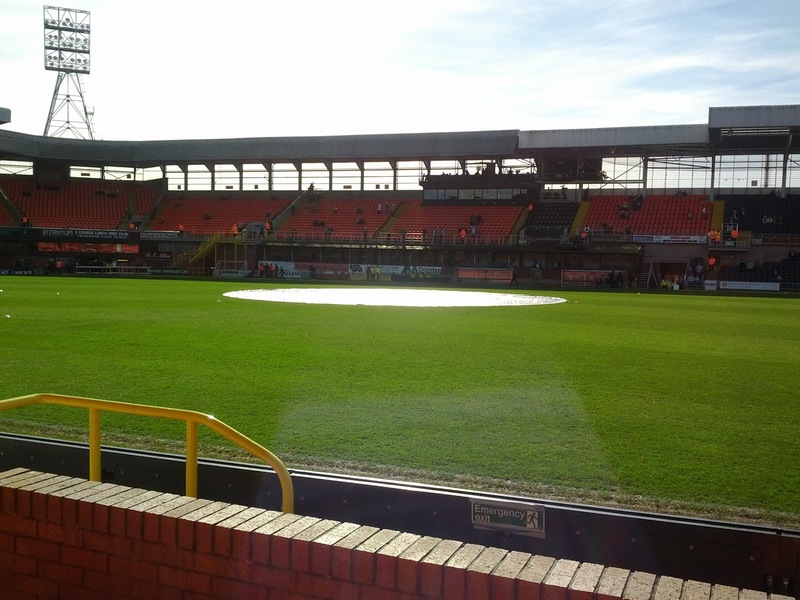 I like Tannadice, one of my favourite away venues, and must admit I have wee soft spot for their team.